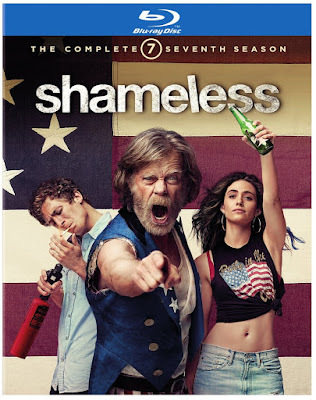 Article first published as Blu-ray Review: 'Shameless - The Complete Seventh Season' on Blogcritics. Love it or hate it, Showtime’s Shameless has been around for quite awhile at this point. The dramedy about a lower class family dealing with social, moral, and drug issues while scraping by on the South Side of Chicago recently released The Complete Seventh Season on Blu-ray, DVD, and digital. It’s an aging program that has grown along with its characters. As much as these twelve episodes continue the story, they also mark a new chapter in the life of the Gallaghers. The result is very satisfying. Most of the characters are changing in The Complete Seventh Season. Fiona (Emmy Rossum) finally begins putting herself first, above family and men. To do this, she tries managing and running a few businesses. Lip (Jeremy Allen White), worried about turning into his father, struggles with sobriety. Ian (Cameron Monaghan) has things together as he works as an EMT and expands his sexual orientation. Debbie (Emma Kenney) finds out what it takes to be a mother to her infant. Carl (Ethan Cutkosky) ponders what it means to be a man. Frank (William H. Macy) realizes he hasn’t been the father he should be, and wants to do better, though he doesn’t quite know how to do it. All of that might sound rather noble and wholesome, but those are two words that often don’t describe the Gallaghers. As they go along the journeys listed above, each at least consider illegal actions, many committing crimes. Past loves and bad relationships threaten to derail progress. Best friends Kev (Steve Howey) and V (Shanola Hampton) get into a thrupple with their employee, Svetlana (Isidora Goreshter). So there is still plenty of the mess fans are used to seeing from the clan and those around them. A theme this year is family. V and Kev redefine theirs, and aren’t sure they like it. Fiona, who has always been the rock, largely abandons hers in the pursuit of economic success. Debbie seeks to build a new family to help raise her child. When the kids he created reject him, Frank looks elsewhere to find the love he seeks. Carl leaves his home to improve himself. Yet, while things get crazy, the Gallaghers have never seemed stronger. More of them are adults now, and so contribute financially and emotionally. They take care of one another in more meaningful ways, and their conflicts matter more. The show keeps the same spirit it has always had, but grows along with the cast. It’s a very satisfying run. Of course, Shameless would not be Shameless without some great guest stars shaking things up. Zack Pearlman (Dragons: Race to the Edge), Ruby Modine (Central Park), and Elliot Fletcher (The Fosters) join the show as new love interests for various characters. June Squibb (Nebraska) and Sharon Lawrence (NYPD Blue) enter to interact with Fiona. Mickey (Noel Fisher) returns with typical craziness, and matriarch Monica (Chloe Webb) vastly changes things when she blows back into town late in the year. The release also contains bonus material. One very good featurette centers on Ethan and Emma, two of the lead performers, and how they have grown up on set. Other cast members, crew, and the actors’ parents contribute their thoughts, and it’s a fascinating insight. A far less interesting short concerns the political leanings of Frank Gallagher. There are also deleted scenes for just about every episode in the set. It’s not a huge amount of extras, but the first featurette is great, and some of the deleted scenes are worthwhile, so it works. Shameless is not getting old. I mean, yes, it’s been on for awhile. But it’s just as entertaining as ever, and if anything, more thought-provoking. If this is the kind of good stuff in The Complete Seventh Season, I look forward very much to year eight. Shameless – The Complete Seventh Season is on sale now.